We have a new extension to the shopping centre here. It opened a few months ago and it’s disappointing. It’s rather empty and most of the shops that were talked about haven’t come. But a week or two ago the much hyped Nandos finally opened. I don’t get the big deal about Nandos but admittedly I’ve only been once or twice and that was years ago. My route to and from CAB takes me past it so I’d been occasionally noticing progress and looking forward to seeing if it’s worth the hype. 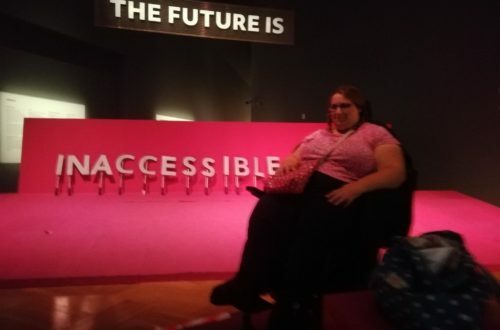 Then it began to look more and more like they’d taken their perfectly accessible new building and made it completely impossible to get a wheelchair in there. It’s built into the side of a hill and they’d levelled off the outside and put steps up to it. Or you could go up the hill slightly then turn back to where it was level. Until they set up an outside seating area that filled almost all of that and a tree blocked the small part that was left. I was furious. Mum was talking about going down on opening day with the press. And a lot of other people had noticed – a friend had spotted it a day or two before I did and complained. When I posted about it on twitter their corporate social media team said all restaurants would be accessible “if possible”. Then when I pushed them and a lot of other people commented how inaccessible it appeared, they said they’d pass it on. A message to the Nandos Didcot facebook page got the response that the layout was temporary and it would be accessible, it had always been going to change. I don’t really believe them. Experience suggests otherwise. When I was talking about this with someone they asked if I would actually go. I said probably. Some friends and I go out to eat once every few months and before this came up we’d talked a few times about trying Nandos. But that it wasn’t about going there, it was about having the option to go or not as I choose, the same as everyone else. Rather than having that choice taken away from me by someone’s having forgotten about those of us who come with wheels when making design choices. Fast forward a month or so and it’s been open about two weeks. We tried to go on Saturday and got turned away. They’d refused to take a booking and when we got there said it would be a 30 minute wait for a table even though there were loads free. They turned several other parties away when we were in there. Not enough staff apparently. The reasons and how long it would be was all a bit vague so we gave up and went to Prezzo. I’ve since heard a friend has been turned away 3 times. It’s almost a perfect example of equality because it’s bad service and it puts me off going back. But as much as I’d rather good service, all I ever want is equal treatment. And that’s what I got this time – the same, equal, bad service as else. “And we have been to Nandos…!” strains of “Fernando” by Abba. We’ve only been once, and will not be writing home about it. All the meals – which show an interesting and unusual range of ingredients – taste of the same char grill. Overwhelming, and underwhelming. That smokey chicken flavour really kills everything else.